Last Fall, my husband, Buck, was fortunate enough to go out with one of our friends to hunt deer. He was excited because he's always enjoyed hunting, but very rarely able to do so. The last time he went hunting was about 10 years ago on a bitter cold Maryland morning. He was the only person in his hunting party to shoot a deer. He'd never even been deer hunting before (Bow hunting wild pigs in Hawaii, yes. Deer hunting, no.) Could he replicate his (long) past success? It wasn't looking good. The light was dwindling in the late afternoon sky, and the final moments when one can legally shoot deer was ticking down. He had seen a couple of deer earlier, but none were close enough to shoot. Ready to climb out of the tree stand, he happened to glance across the field and saw a buck crossing the street. The buck stopped after a few feet, putting it about 150 yards away, and my husband knew it was now or never. He took the shot, and the buck jumped; luckily (and maybe incredibly) running towards him. He took another shot and hit him, and when it finally came close enough, he shot it again, putting it down. Yes. Buck killed a buck. Meanwhile, our friend texted him: "What's with all the shooting? Are you starting WWIII over there?" My Buck was elated, and even did a dance. It was captured on video, but regrettably for me, and for you, it was too dark to see it clearly. I'm sure you all can paint a vivid enough picture in your imaginations. We now had a lot of venison on our hands. Ground venison. Venison steaks. Summer sausages. Ground venison sausages. Our freezer was stocked. Now what in the world would we do with it all? It's a good thing I like venison (the taste is excellent, and it's one of the leanest red meats you can have), so we had fun trying various ways to use it up. One of my favorites was using the sausage in a frittata loaded with veggies and some parmesan. A couple of weeks ago, Buck decided to use the last of the ground venison and venison sausage to make burgers. I was pretty apprehensive - I've never had sausage in my burger, but what the heck, I was willing to try it. Ground venison and sausage venison burger. So very, very yummy. It was beyond delicious. 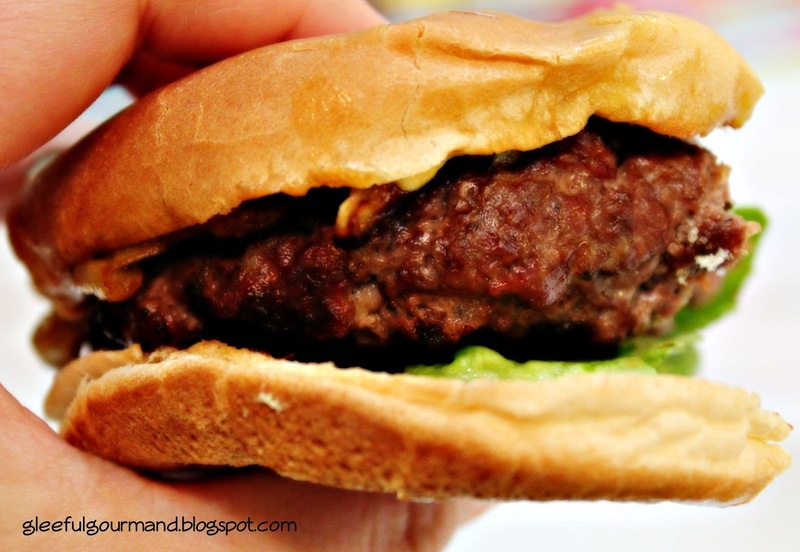 Juicy, and so flavorful I could feel fireworks going off on my tastebuds, it may have been the best burger my husband has ever made. He employed some pretty interesting spices in the mix, and not the kind you would automatically think would work well with burgers, but oh man, did they ever. We caramelized some onions to go on top, and piled on some buttery-soft Boston Bibb lettuce. We smeared Dijon mustard on the toasted buns, the perfect compliment to (possibly) the perfect burger. I thought this looked amazing when I saw it originally, but forgot how great the pic was. Just pinned it!